It has often been said that there is a surprising number of Southern gospel fans in Scotland given the genre's obvious American roots and this was certainly something that was borne out as folks turned up at the start of May to Perth's Revival Festival Of Music - a three day event co-ordinated by Scottish Christian radio station Revival FM with the aim of inspiring, encouraging and uplifting Christians and those seeking God in their lives. Having pulled off something of a coup in securing the services of top US harmony act Legacy Five, Revival FM also brought in vocal trios the Pathfinders and Crimson River (from North Carolina and Belfast respectively) as well as 23 year old female country gospel singer KC Johns to give proceedings an overall Southern gospel and country feel. Keen to recognise home grown talent, the festival also featured the vastly experienced and world-renowned worship leader Ian White - playing to his home crowd for once - plus prolific Orkney singer/songwriter Michael Harcus and some teaching from Aberdeen-based Christian author Jeremy McQuoid to round off an ambitious weekend of six concerts at the sumptuous Perth Concert Hall. The transatlantic bonhomie was evident from the off as hosts US record producer Scott Godsey and kilted Scots announcer Peter Drysdale swapped quips and introduced undoubtedly the festival's headline attraction Legacy Five to kick things off on the Friday evening. What followed over the next few days were a number of heartfelt performances from different acts as they spoke and sang with heartening honesty about some of the genuine problems and pains they have faced in life and the profound difference a relationship with Jesus has made to them. With numerous highlights stretched over the entire festival, a heart-wrenchingly poignant rendition of the old hymn "It Is Well With My Soul" from Crimson River together with the quiet reflection of Ian White's simply stunning "The Time For Faith Is Now" made for genuine pin drop moments whilst the homespun charm and God-given sincerity of Michael Harcus - with wife and backing vocalist Teenie and pianist Mairi Warren in tow - never failed to touch the hearts of the Perth Concert Hall crowd. In addition, the humour, camaraderie and sheer musical talent of arguably Southern gospel's finest group Legacy Five (aptly described on stage by Ian White as being at the top of their art) added a classy sophistication to proceedings whilst White prodigy and Perth schoolboy tenor Liam Bonthrone stole the show on the Saturday evening with a near immaculate rendition of Charles Wesley's "And Can It Be" under the watchful eye of his mentor. Add to the mix a sense that each act was all the while learning to collaborate with their previously unmet colleagues on stage whilst becoming lifelong friends off it and it was perhaps no surprise that the crowd walked away with a new found feeling of warmth by the final curtain call on the Sunday evening. A curtain call which followed a stirring rendition by the whole cast of the Gaither stalwart "Because He Lives" - with Harcus giving Legacy Five top man Scott Fowler a run for his money in the lead vocal stakes - and an equally touching moment when the audience sang the 23rd Psalm set to a Scots melody to the artists on stage before the lights went up for the last time on the Revival Festival Of Music. I caught up with some of the acts that made the festival an undisputed success. 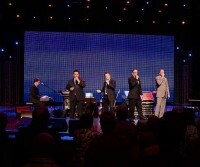 Southern gospel masters Legacy Five have been on the go since lead vocalist Scott Fowler and the late Roger Bennett left the legendary Cathedrals to join fellow founder member Scott Howard in 1999 and have since become recognised as one of the genre's premier acts. Following a number of personnel changes, the group now consists of tenor Gus Gaches, bassman Matt Fouch and virtuoso 23 year old pianist Trey Ivey in addition to the two Scots and I ask what taking part in the Revival Festival of Music has meant to them. "Well, we were talking earlier today that we had to come all the way to the UK to meet some folks from the US that we didn't even know existed," responds Scott Fowler. "We've got to meet some more of our folks and guys from Northern Ireland and Scotland too. It's just been a great time." "The people here in Scotland are incredible and it's a neat thing to see," adds Gus. "Their outlook is so positive and that's the thing I'll remember about this festival. I was just amazed about how upbeat everyone has been. We've got to come over again real soon." Based in North Carolina, Southern gospel trio the Pathfinders feature the harmonies of founder members Dearl Lemons and Dawn McGuire and recent addition Gary Russell to give a gentle country gospel sound that has seen the group receive several nominations at the prestigious US gospel music Diamond Awards. The Revival Festival Of Music heralded the team's first visit to the UK and I ask Dearl how the Pathfinders came to be involved. "Scott Godsey, the vice president of our label Homeland Records and compere for this festival, contacted us and asked if we had our passports," he explains. "I figured we were going on another cruise and then he said we were going to Scotland to play at the Revival Festival Of Music! We really appreciate the opportunity to do something like this." I wonder how different things are across the pond compared to North Carolina and the US as a whole. "Back home, our country is going through a lot and this country is too so we've got so much in common," advises Dawn. "In both places, we've got people who are starving to hear the word of God - it's right there in front of them but they don't take time to listen. Sometimes the only message they can hear is through song because they might go to hear someone sing but not someone preach. If God calls us to be used in our own country or somewhere else, we have to go and work for him. The link between our two countries is God - we both serve the same Lord."